◌ Do more for me. ◌ Use what I've already got. ◌ Build upon to something better. ◌ Paint more. Paint often. I've got so many art supplies that had been gathering dust. 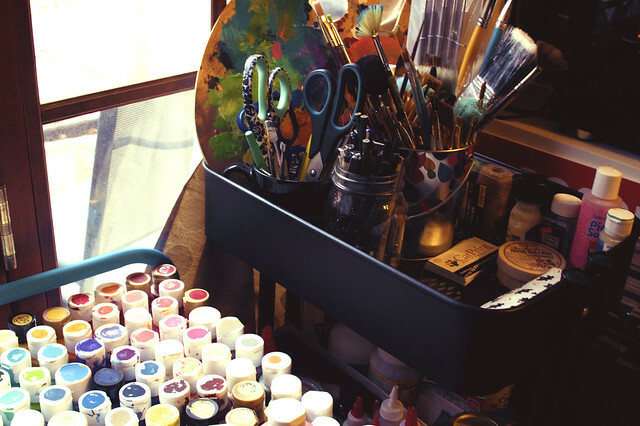 Canvases, paints, watercolors, gouache and more. I want to paint more often and build upon the skills I learned while in art school. I've seen that it's improved my mood over the past few months and want to continue painting. ◌ Get outside more. I'm way too pale. Let's get my freckles darker. 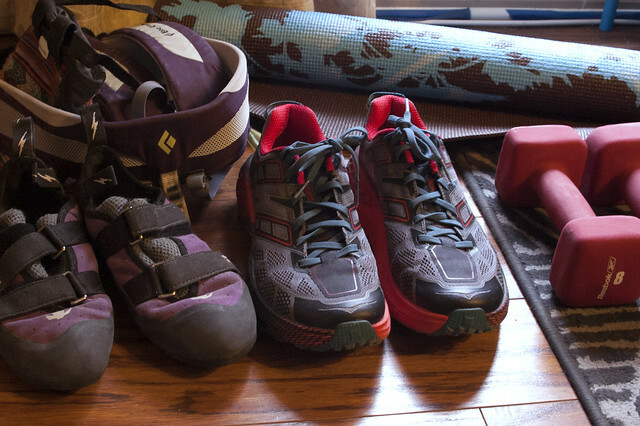 Hiking, running, walking and riding my bike are all on my list of things to keep doing more of. ◌ Get back into shape. Indoor rock climbing was something I absolutely loved. I canceled my membership when my work schedule was so crazy I had no time to go. So I plan to go at least once a week. I've also been dancing, lifting weights, running, hiking and working out with friends. Let's see if I can drop some weight and tone back up. ◌ Make time for friends. ◌ Get at least ONE IT certification. I'm currently studying for CCNA. ◌ Improve my video gaming skills. This might seem silly to a lot of people but I'm trying to get myself into more positives KDR in gaming. 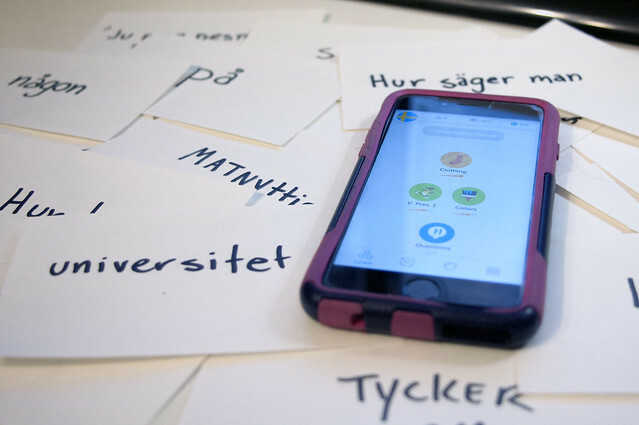 ◌ Speak Swedish. Visit Sweden. A big goal for me this year is to finally visit my friends in Sweden. I had the opportunity last year but traded it for our UK trip. So this year I've made it one of my biggest priorities to save up money for. I plan to attend Dreamhack Jönköping 2018 (November/December) and be want to able to hold a conversation in Swedish with my friends. How: I've been studying using Duolingo at least 4 hours every week. I also play video games with my friends in Sweden and try my best to interact with them in Swedish vs English. It's really helped me learn and retain what I've learned. 2017 was the year I let myself succumb to stress and bad health decisions. I put myself in situations that jeopardized my physical and mental health. And over the summer, I reached a point where all of it came crashing down. I was in a dark place that was hard to get out of. And one evening I almost made a permanent mistake. I quit my job the next day. I realized that I was living up to the expectations of people that could care less about me as a person. Or people who didn't want me around. And when I felt like I couldn't meet their expectations, I felt worthless. I've spent the last 10 years worrying about how much people liked me. I would change my personality, my habits and even my interests to get the approval of others. I was bending over backwards to make myself into a person I wasn't. So over the last few months I thought long and hard about what I wanted out of life and where I want to be in 10 years. In November, I built a new list of life goals and decided that I would instead do more for me. My 2018 resolutions aren't new goals. They're the revival of the person I was always meant to be. So this year I plan to use what I've already got (my art, my studies, my fitness) and focus on myself to build up to something better. While planning for our trip, I fell trap to pinterest researching all aspects of Edinburgh. I read every list and gathering to get an idea and feel for what to expect. One of the smallest tidbits I found while reading was a blogger who mentioned going on a day trip with the travel company Rabbies. 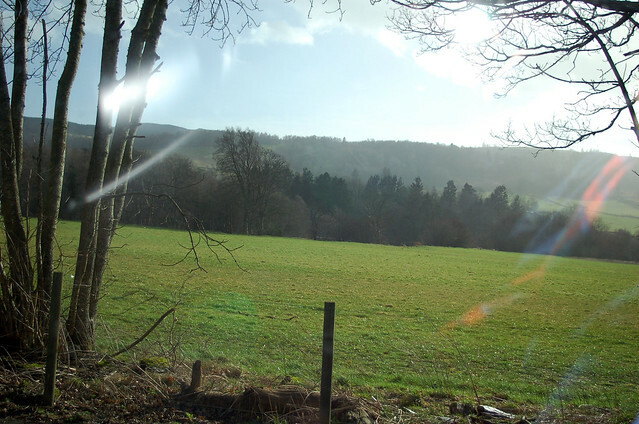 Even in March, the Scottish highlands are green and beautiful. Words can't put into perspective how breathtaking the scenery was. Even months later, I can still feel the excitement in my heart for how wonderful we had. Every stop there was something to see. While in Pitlochery, we chose to cut short our lunch to instead go shopping at MacNaughtons Kilt shop. My husband had been wanted to accessorize his kilt and purchased a few items. We then rushed across the street for some quick fish n' chips with plenty of time to stop at a corner shop and grab an ice cream. 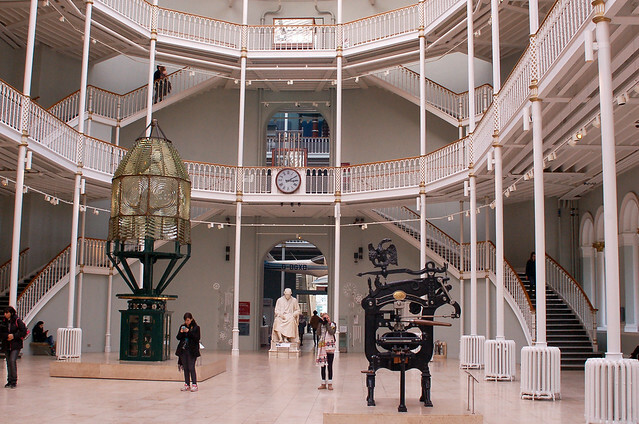 One of the coolest random things we did during our stay was to visit to Edinburgh was seeing the National Museum in Scotland. It's a beautiful place and like most museums in the UK completely free to enter. We spent roughly 1.5 hours here but had we the time we could've easily spent the entire day. The National Museum is equal parts Art, Science & History. Some of the coolest things we saw while here was Dolly, the cloned sheep (taxidermied and on display) and a piece from CERN's LEP Collider. There was so much to see the the care and expertiece put into each and every exhibit was well worth the visit. 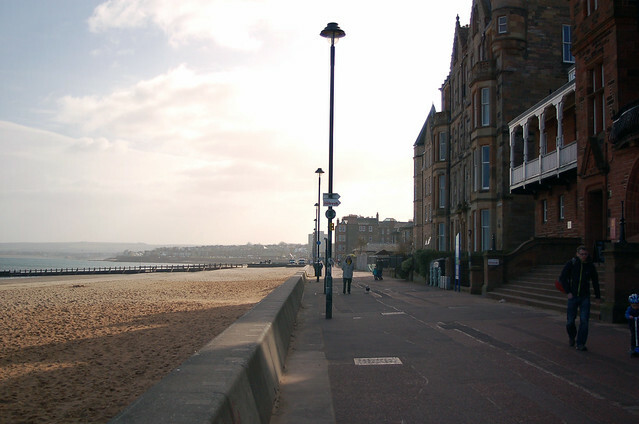 Part 2 in our Edinburgh series, Portobello Beach! Located just a 20 minute cab ride from the city center, it was a perfect way to spend our first morning in Scotland. We visited in March, so the weather was still too chilly for us to go swimming. but that didn't stop us from walking right up to the water. We walked the beach front, picked up some shells and people watched all morning. Around lunch time, we wondered back into the town proper and wandered the main strip. We found a pub called The Beaten Dock on the way back that had some of the best fish n chips during our whole trip,! And later a coffee shop that unfortunately has closed since our visit. Much to my mother's dismay, I'll be adding color to my hair again this week. I've dyed my hair before a few times. But I've never truly been happy with the quality. I usually spring for the bathroom-special. Over the counter and all over the sink styling. The one thing about my hair though, is that it soaks up color like a sponge and yet the dye rarely takes. I've had numerous hair dressers profess that my hair takes an usual amount of color when dying. So through trial and error I've given up on at-home dye jobs and settled for the fact that this is a studio trip. I've been saving up and am ready to take the plunge back into colorville. Being a bar manager at an arcade, I have the ability to get a bit crazy with my appearance. The only problem I am running into now is deciding which color to choose. There's so many options and I've got reasons to love them all. Here's my top favorites! 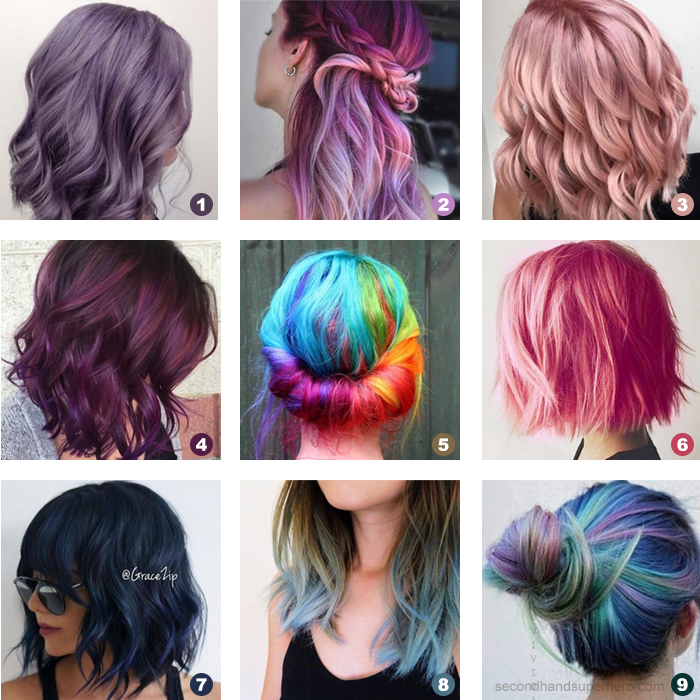 I'm leaning towards the ombres and softer colors since I could go longer without having to redye my hair. It might be lazy, but at least I'm being realistic with my expectations. What do you think? Have you ever dyed your hair crazy colors?